Smiling young people, estimate quote calculator, performance statistics, info about educated and motivated authors with PhD rank, and 10 years of overall field experience. 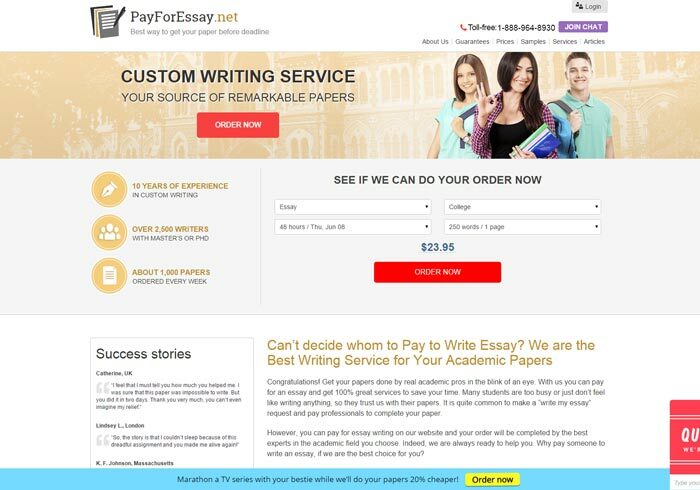 That is how payforessay.net essay writing service meets potential customers. What is covered behind, if one tries to dig a bit deeper? We took our look onto it. Payforessay.net presents essay, coursework, term paper, thesis, dissertation writings. Quite a standard service list. Though, when guaranteed to be written by a Master or PhD graduated writer, service texts are expected to be quite of a quality. Additionally, they say to create 100% original texts with individual approach to every order. Extra services include editing, proofreading, proposals, acknowledgements, free samples and standalone chapters or plagiarism check if required. According to the information displayed on a payforessay.net homepage, all the ordered works are written from scratch, and following the client’s instructions, allowing them to control the process from the start and to the very end. By the way, this service works with different text levels: from high-school essays to PhD dissertations and reports. Displayed prices look like quite close to the average ones, but there are essay writing services which can offer lower prices on the market. Still, quality of writing samples shown on the appropriate page seems to correspond with the wanted costs. Additionally, the company offers 2-week free revision period for every order, bonuses and discounts for clients, and money back guarantee in case if the writing doesn’t meet the requirements. Standard options nowadays, nothing special here. Though, this doesn’t save this service from its own writers who create papers for its customers. You risk to get cheated here, as the completed essay we’ve ordered was delivered 4 hours AFTER the determined 3-days deadline, being completely another writing than the one we mentioned in order instructions. Still, even the best manager can’t save an essay writing service from itself. It is the business where you need to write good, or not to write at all. Payforessay.net doesn’t belong to the first category.